First Row Seated, L to R: Gus Genetti, Esther Bott Clark, Jean Branz Daly, Catherine Branz LaPorte, Betty Zambotti Reich, Aunt Ann Genetti NcNelis, Leo Zambotti, Catherine Genetti Farkus, Rita Genetti Young, Agnes Bott York, Marianne Genetti, Bill Genetti. 1st Row Standing, L to R: Val Genetti, Gus Genetti III, Joseph LaPorte, Louis Reich, Erma Zambotti, Steve Farkus, Elaine White Young, unknown, unknown, Pat Genetti. Thanks to Jean Branz Daly, we have just added a few more reunion group photos to our Reunion News page. 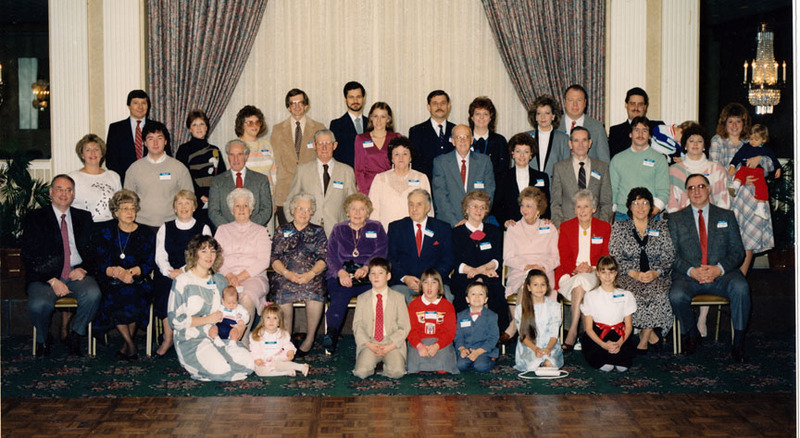 Take a stroll down memory lane and see what the Genetti family looked like in years past. Click here then scroll to the bottom of the page to see reunions from 1983, 1987, 1992, 1994 and 1995. Jean even provided most of the names for the 1987 photo. Alas, many of our old-timers are no longer with us. Some who were pictured in the early reunions, were born in Castelfondo, Tyrol (Stanley Genetti, Ann Genetti McNelis). We owe them a debt of gratitude as the first immigrants of our family. They came to Pennsylvania as children, forging a life for future generations. Their children were the first generation to be born in America. Many of our 1st generation family members are also pictured throughout the years (Jean Branz Daly, Catherine Branz LaPorte, Gus Genetti, Bill Genetti, Marianne Genetti, Betty Zambotti Reich). Can you help identify others in our reunion photos? I know some, but not all. It would be a great gift to the family if we can positively identify each person in all of these photos. If you can help or you were in any of these photos, write me at info.genetti.family@gmail.com with your photo names, reunion year and position in the photo. Many thanks to Jean Branz Daly (the granddaughter of Damiano and Oliva Genetti). Jean has been a frequent contributor to our family website and we are sincerely grateful! Grazie mille Jean! Hey – have you sent in your Reunion Reservation yet? Only one week to go before the reservation deadline of September 1st! Don’t miss out on this special event – meet new cousins, hug old cousins, two special presentations, great food and loads of door prizes! It will be a memorable weekend for all, celebrating our Genetti Family heritage! Have you mailed your Reunion Reservation Form yet? The reservation deadline is fast approaching – you only have 15 days left to reserve your space for the Genetti Family Reunion 2016 (deadline is September 1st). What are you waiting for? It’s important that all reservation forms are received by the requested deadline. Patrick at the Genetti Ballrooms needs a head count to reserve the right size room and to plan our meals. Please don’t delay – print your Reservation Form and mail it TODAY with payment. Click here for the online Reunion Reservation Form. So far we have cousins attending from nine states! And I know from your emails, there are many more of you who are making the trip to Hazleton but haven’t sent in your reservations yet. Only 50 days left until “Reunion 2016: A Gathering of Genetti Descendants.” Reunion Weekend, October 7-9, will give you the opportunity to meet new cousins, share family stories and learn about our shared ancestry. If you have enjoyed reading our family website, we have so much more to tell you during our special DNA workshop and evening presentation. Each and every one of you is a vital part of our Genetti heritage! We look forward to your attendance and participation at this event to celebrate our family and the centuries of history that came before us. 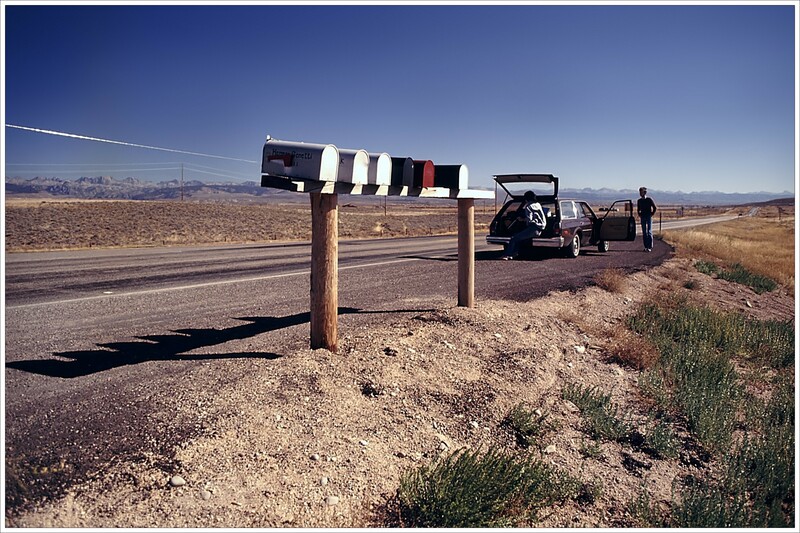 Don’t hesitate – print out your reservation form and get it in the mail today! We have received several requests from non-family members who would like to attend our Saturday afternoon workshop: “The Basics of DNA Testing“. So due to “popular demand” we have decided to open the workshop to the community with a small admission fee. If you are NOT a Genetti descendant but live in the Hazleton area and would like to learn more about DNA testing, there is an admission fee of $10 to attend the afternoon workshop. Reservations are required with a deadline of September 15th (for workshop only). To make reservations, please click here for the Workshop Reservation Form. Have questions? Click here for our online Contact Form. If you are a Genetti descendant, attending the reunion weekend and have made a reservation for the evening Banquet Dinner, the Saturday workshop and after-dinner presentation are included in your reservation fee (there is no additional charge or reservation needed for either presentation with the purchase of your banquet dinner). Thank you to the generous people and companies who have supported Genetti Family Reunion 2016! Your donations and in-kind gifts are most appreciated. Click here to visit our new Reunion Sponsor page. Stop by and see all of the goodies donated to our Reunion Weekend. You’re sure to walk away with some super Genetti “swag”. Click here to see Reunion Prizes. The reservation deadline is fast approaching! All reservations for Reunion activities must be in by September 1st! Visit our Reunion News! page for more info. Click here to download your 2016 Genetti Reunion Reservation Form. Surprises abound when you are connected to your roots! I belong to a private group on FaceBook called Chei da Chastelfon. 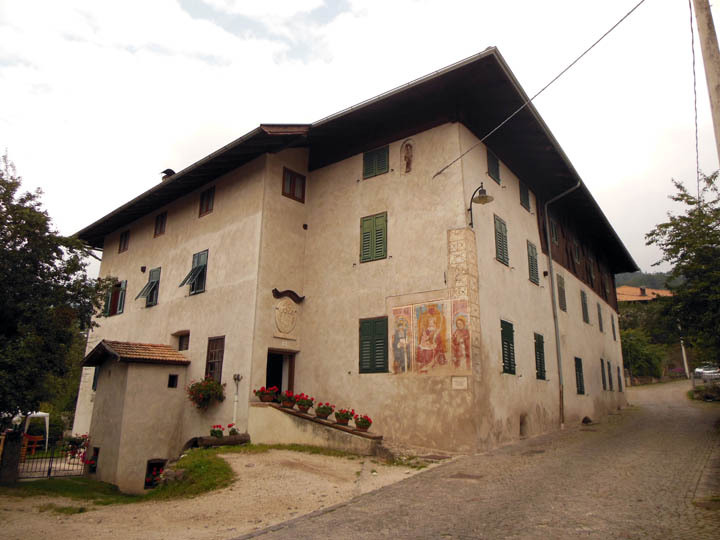 Members are either from my ancestral village of Castelfondo in Trentino or have family members who were born there. A few days ago I found this fantastic black and white photograph on Chei da Chastelfon’s group page. It was posted by Luciana Genetti, one of my Italian cousins. Luciana and I share my 3rd great-grandparents, Antonio Genetti and Veronica Panizza. In official cousin terms, we are 3rd cousins, once removed. Luciana’s beautiful vintage photo was captured sometime around 1916 and is the Castelfondo home of Genetti Lanci. Yes, my ancestors were “Lanci” – a sopranome or nickname used by a particular branch of our family. I have been told that “Lanci” was originally from old German meaning Lance. I have no idea where or how this sopranome became attached to our branch of the Genetti family other than it is noted in baptismal records as early as the 1600’s. You can still see the sopranome used today on family markers in the village cemetery. The Genetti home today, with restored fresco and carved Coat-of-Arms over the doorway. 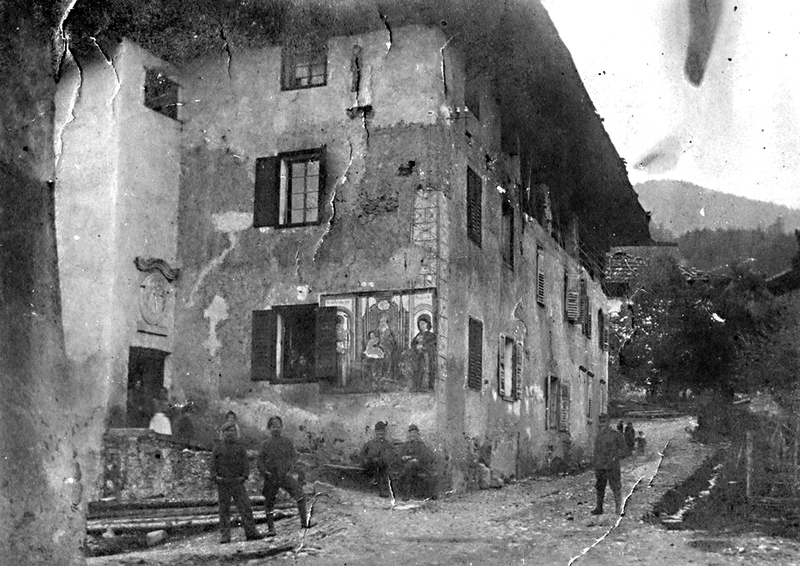 If you remember world history, at the time this photo was taken it was during World War I. Tyrol was, and had been for centuries, part of the Austrian-Hapsburg Dynasty. Only in 1918, after WW I, was Tyrol turned over to Italy to become the Northern Italian province of Trentino. That is why many of our ancestors who immigrated to America around 1900 considered themselves Tyrolean (not Italian) and had Austrian passports. Here is what Casa Lanci looks like today. As you can see, the home has been restored and updated. The structure dates to the mid-1500’s (or possibly older). It now houses five apartments, several of which are owned by Luciana and her sisters. The beautiful fresco of Madonna and Child, seen on the front side wall, was restored in 1998 with funds donated by Adriana Genetti, Luciana’s sister. La nostra gratitudine a Luciana per contribuire questa foto. Mille grazie! I have also added Luciana’s photo to our photograph page of Castelfondo. Take a quick visit to our ancestral village, click here to access this page on our family website. We have collected oodles of door prizes, raffle prizes, give-a-ways and even an auction piece for the upcoming Genetti Reunion. If you are planning to attend the weekend festivities, there’s a great chance you will go home with some fabulous Genetti goodies! Descriptions of all prizes and give-a-ways are online at: Reunion Prizes! Have any interesting family-related items that you would like to donate to the reunion as a door prize? I’m thinking along the lines of vintage or collectible Genetti memorabilia – or books related to our Tyrolean heritage. Maybe you are an artist, writer, craftsman or musician and would like to share a small piece of your art with us. Do you own a business? How about donating a gift certificate to your establishment. All donations will be included on our Reunion Prizes page as well as our Sponsor page (to be posted soon!). What creative ideas can you come up with? Email me at info.genetti.family@gmail.com if you have a door prize donation and I will send you delivery instructions. Only 67 days until Genetti Family Reunion 2016! Have you sent in your registration yet? Click here to download your Reservation Form. Remember – all reservations must be in by September 1st!